Disputes over fisheries could spark the next war. The Indonesian government is blowing up foreign vessels found to be fishing illegally. In the Gulf of Aden, fishing vessels are conduits for arming rebel and terrorist groups. In Latin America, illegal fishing and the drug trade are linked. In the South China Seas, territorial conflict between the Philippines, Vietnam, China, and other regional nations is inflaming tensions over fishing grounds and increasing the risk of major conflict. It is important to better understand the causes and consequences of fisheries conflict - including which ones could ignite armed disputes and which will fizzle out. One Earth Future (OEF) today announced the creation of the Fisheries Conflict Research Consortium (FCRC) to investigate this issue and answer key questions relating to fisheries conflict, marine resource sustainability, and national security. The FCRC is led by OEF’s Secure Fisheries program and includes members from Marine Management Solutions, Oregon State University, Paul G. Allen Philanthropies, Stimson Center, Texas A&M, University of British Columbia’s Global Fisheries Cluster, University of Denver, University of Connecticut, University of Rhode Island, and University of Wollongong. “Demand for fish is increasing, but fish stocks are declining around the world. Understanding how fisheries can contribute to peace through food and economic security, while avoiding conflict over finite fish stocks and the ocean territory they occupy, is imperative,” said Sarah Glaser, Senior Research Associate at Secure Fisheries. In fact, the root causes for conflict over fisheries are a direct result of communities losing their livelihoods and sustenance from overfishing, illegal fishing, and industrial fishing. The FCRC will promote peace and sustainability within global fisheries. It will improve knowledge of the root causes, impacts, and resolution of fisheries conflict, while informing approaches and technologies to advance environmental sustainability, food and livelihood security, and peace and order around the world. The Consortium is seeking new members interested in contributing to collaborative research and outreach around this issue. For more information, please contact Jean-Pierre Larroque of One Earth Future at jplarroque@oneearthfuture.org. 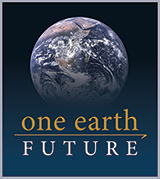 One Earth Future is a self-funded, private operating foundation seeking to create a more peaceful world through collaborative, data-driven initiatives. We focus on enhancing maritime cooperation, creating sustainable jobs in fragile economies and our research actively contributes to thought leadership on global issues.